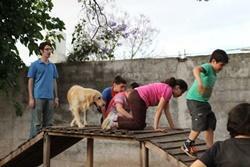 Our Canine Therapy project in Argentina enables volunteers to combine elements of our Care and Animal Care projects. 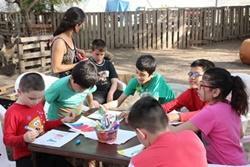 Volunteers work alongside a team of local professionals at the Jingles Foundation in Alto Alberdi, Cordoba and conduct specialised therapy sessions for children and young adults. The Jingles foundation has approximately 30 dogs of various breeds and ages; these animals are carefully selected and trained to be alert, obedient and of a non-aggressive nature. Volunteers will work with the dogs and children and focus on the social aspect and the benefits of canine therapy for locals battling with psychological disorders, like motor and sensory impairments or behavioural disorders. It has been proven that regular contact with animals can increase the patient’s mobility and both stimulate and comfort the children. Volunteers will learn about areas such as speech therapy, kinesiology, neuro-rehabilitation and psychology for individuals, families and/or groups who specialise in handling animals. Although volunteers may feel that the work is not very structured, the supervisor will be happy to discuss the work schedule with them.